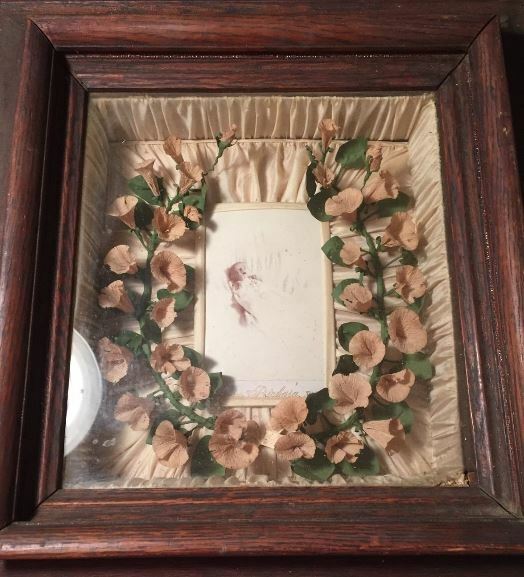 Detritus of the Dead, a dead infant’s photo framed in a coffin-like shadowbox by a fabric flower wreath. Former eBay listing. In the theatre noir of Victorian mourning, textiles took center stage, providing backdrop, scenery, costume and props. Crape, the quintessential mourning fabric, darkened clothing, doorknobs, and public building facades. Textiles veiled the widow, covered the coffin, and enshrouded the corpse. The hairwork wreaths and mourning embroideries created by mourners to enshrine the memory of the dead, might be framed with the coffin plate of the late-lamented and hung in the front parlor as a kind of domestic reliquary. Today, of course, crape has rather fallen out of fashion as a mourning textile. In fact the only mourning textiles we find these days are “funeral blankets,” also called “sympathy” or “memorial throws.” These ghastly objects are often printed with angels or the “Footprints” poem, and may be personalized with the name and dates of the deceased. A far cry from crape fluttering ominously from the doorknocker. There must be many other bereaved artisans creating similar intimate memorial works from family garments. Unsurprisingly, this thread of mourning arts and crafts runs back many years. An Up-Town Artists Who Makes Gorgeous Posies of Peoples’ Old Clothes. Gaudy Wreaths Evolved From the Depths of the Family Rag-Bag. “Remember the Loved Ones! 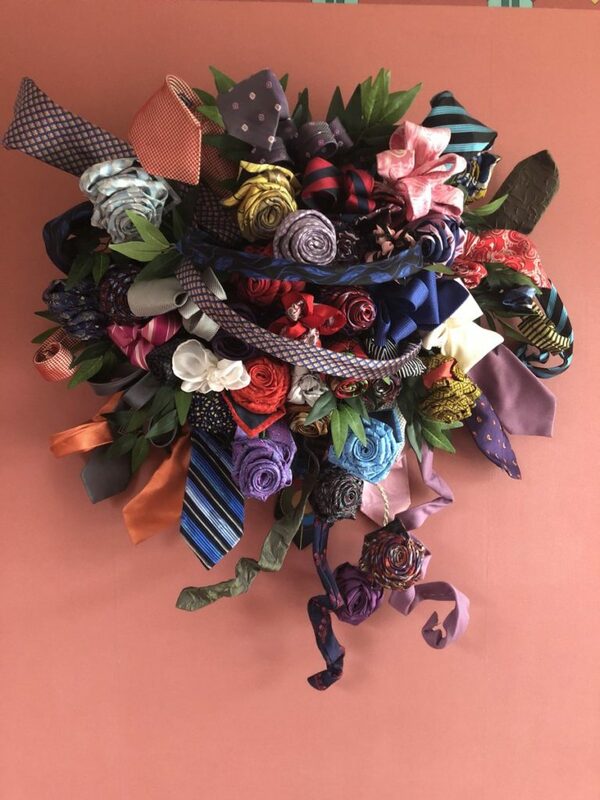 Memorial Flowers Made of Your Deceased Friends’ Clothing.” This is the simple inscription on a tin sign, nailed against the front of a private residence on Columbia avenue, near Twenty-second street. A passing reporter saw the sign and sought an interview with the person who puts sentiment into old clothes. The bell was answered by an artistic-looking lass, who ushered the scribe into the studio to await the advent of the master, who happened to be the mistress of the establishment. Around the apartment there were distributed glass shades covering specimens of unnaturally luscious-looking fruit and supernaturally bright-colored flowers, all wax. On the walls hung several frames containing what looked like somber tinted prints of mournful weeping willows, monuments, crosses, wreaths, and other mortuary emblems, which proved, on inspection, to be human hair wrought into these various cheerful shapes. While the reporter was still inspecting these works of art and remembrance the lady of the house entered. “Good morning. You’re looking at some of my relics, I see. Pretty, aren’t they?” was her greeting. Without ascertaining her visitor’s wishes she began to explain the various designs and to tell how many premiums she had taken at country fairs. “Do you really make flowers of old clothes?” asked the curious newspaper man. “Yes, indeed; that is a part of my business. In fact, it is the feature that I want to make the leading one. It is a new departure, and there is no limit to its possibilities.” Before the reporter had left he was fain to believe there was not. The floral artist then proceeded to prove in a most conclusive manner what could be done by showing what had been done already, and when all is known it is as simple as it is ingenious. Samuel of Posen could not make a necktie out of a pair of socks with more ingenuity. Given a sufficient quantity of old garments and the skill imparted by the artist at one dollar a lesson, the problem of how to make the flowers is easily solved. The process is much like that of making artificial flowers for ladies’ bonnets, the difference being that instead of selecting the colors to suit the design to be wrought the design must be made to suit the materials at hand. Right there is where the skill of the manipulator to adapt means to end [sic] of ribbons and scraps of cloth comes into play. Two wreaths, in which the artist takes especial pride, were shown to the reporter to illustrate this point. One was made from the clothing once worn by a dead grandchild. It contained, besides a number of roses fashioned of the white muslin of tiny skirts, a number of odd-shaped leaves made by cutting out the pattern of the embroidery upon the edge of the same. A daisy’s blossom had the white stuff of a baby stocking cut in strips for petals and a yellow-covered button for a center. There were queer-shaped botanical specimens evolved from striped and plaid percale, and unnameable blossoms in navy blue and cardinal wool that only the brain of a grower of flannel flowers might conceive. The second wreath, the admiring newspaper man was told, contained flowers made of the clothing worn by the artist’s own first infant. In this white blossoms predominated, as was explained by the proud mother, because “there is not so much variety in an infant’s dress as in an older person’s. But white flowers are so much more appropriate for a little babe that is all innocence and purity, and besides, they never will fade, you know.” The skeptical scribe didn’t pretend to know. With pride the mother proceeded to point out a pale buff pansy made of the kid of a tiny shoe, and a few little snowdrops of cotton that had been stuffed into the toe of the shoe to make it short enough for baby’s foot. The gem of the whole collection and the one which was shown with most gratification was a cream-colored lily on the inner circumference of the wreath, which the loving parent triumphantly explained was a part of the crape scarf that hung on the door-knob when the little one lay cold in its casket. Another wreath, more gaudy in color and more cosmopolitan in make-up, was one of all the shades of the rainbow and several others besides. It was in itself a whole family history. “A red, red rose” was a part of her married daughter’s last new bonnet, and a delicate white blossom called to mind the dress she wore when she was made a wife. A wild-looking tiger lily was once part of a colored underskirt. The blossoms that old the story of the rest of the female side of the house were in such colors as were not found in all the bright robes worn by Solomon in the days of his glory. Just at this point a Columbia avenue dude passed the window. The disgusted artist espied him and exclaimed: “Wouldn’t I like a chance to make a bouquet for him out of his clothes? That spotted jacket would be just lovely worked up into tiger lilies and sunflowers and his legs would make elegant stems for the flowers if they were a little thicker and not so crooked. The many advantages of the faille and linen flowers are causing the trade in them to grow and the florist who now does the chief business in growing them has confidence that as soon as their virtues become more widely known some of the florists will be compelled to shut up shop for lack of something to do. When it is considered that they don’t fade or wilt under the hottest rays of the sun or freeze though attacked by the coldest blasts of winter, the mall sum of $20 asked for making a medium-sized wreath sinks into insignificance and it will be admitted that the genius that originated the idea of remembering dead friends by their old clothes is a benefactor of the race. Most readers would have nodded knowingly at the first level headline. Flannel—also known as shrouding flannel—was formerly the main textile used for shrouds. Some relicts were not content just with flowers made from the deceased’s wardrobe, but added the detritus of the dead to their memorial collages. This widow, with an eye to future historians, carefully labeled all the artifacts. A unique piece of handiwork has just been completed by Mrs. Sophia Laramore of Waterbury, Conn., who is now approaching her 70th year. It is a mortuary wreath In memory of her husband, who was dead nearly five years before the curious symbol was begun. She made it of relics of her late husband, and of articles which were the property of the wives who preceded her. The frame is of putty, into which while soft the widow placed, among others, the following articles: In the center of the top cross piece are the spectacles of her late lamented and a small vial containing the pills which were left over from his last Illness. Besides these the Hartford Courant says there are many small stones which he had treasured during life, his jackknife. a piece of candy, which she says be had left uneaten; buttons of all kinds from his old clothing, and a small bottle containing cheese made by his first wife. All of this collection is labeled, as, for instance. “The smelling bottle used by the wife before me.” Inclosed in the frame is a picture of him whose memory the wreath is supposed to perpetuate. The wreath above the portrait is composed almost entirely of flowers and leaves, each of these made either of some portion of his coat, waistcoat, trousers, neckties or suspenders, and worked together artistically. The shirt in which he died is honored by having made from it a showy bird, too wonderful and strange for description. Just outside the wreath are placed suspender buckles and watch chains entwined with the hair of the mother of his first wife. Some of the hair of his own head has been made into tendrils, and the stamens of one of the flowers is of the material that lined the coffin. On another side of the wreath is a bunch of raisins he bought her the winter before he died, saying: “Now don’t cook any of these, but eat everyone.” Balancing the raisins are three wires, each supporting one of his teeth, and behind them the last toothpick he ever used. And this Vermont widow found solace in a mixed-media memorial to her husband made from all manner of sentimental scraps. The latter two stories remind me of African-American conventions of leaving objects important to the dead person at the burial place. As James M. Davidson writers in “Keeping the Devil at Bay: The Shoe on the Coffin Lid and other Grave Charms in Nineteenth and early Twentieth Century America,” sometimes the last items used by the deceased–medicine bottles, dishes or spoons–were interred with them or carefully positioned on the grave. (You can find a contemporary description of the practice as found in Washington D.C.’s Mount Zion Cemetery in The Victorian Book of the Dead, where the stories of the Pennsylvania wreath-maker and the Vermont widow also appear.) I should emphasize that the making of these unconventional wreaths was certainly not a widespread practice, but it was novel enough to interest the press. Other examples? chriswoodyard8 AT gmail.com, who has a brimming junk drawer handy for post-mortem use.